Even in France, any man who tells a woman he also digs George Michael’s Wham! and the movie Dirty Dancing has to be lying. At least Alex Lippi is not doing it for amorous reasons. It is strictly business for him. Hired by clients to break-up the dysfunctional relationships of their loved ones, Lippi’s business is seduction. Yet, he will face his greatest professional and personal challenge in Pascal Chaumeil’s Heartbreaker (trailer here), which opens this Friday in New York. Lippi has one hard-and-fast rule: he never breaks up genuinely happy couples. However, his impatient loan shark provides sufficient incentive to break that rule in the case of Juliette Van Der Beqc and her apparently perfect do-gooder fiancé. Working undercover as her bodyguard, he gains access to the betrothed wine expert, but even with the inside information assembled by his sister Mélanie and her loving doofus husband Marc, the break-up specialist has trouble closing the deal. Instead, it is Van Der Becq who inspires Lippi to break his other unstated but clearly implied rule when he starts falling for her himself. Obviously, complications ensue. There is a fair amount of broad farcical humor in Heartbreaker, much of it supplied by Lippi’s sister and brother-in-law. However, Chaumeil's film is an unapologetically sentimental rom-com at heart. Fortunately, it all more or less works thanks to the strong chemistry between the two leads. Romain Duris (Juliette Binoche’s brother in Cédric Klapisch's Paris and the focus of a BAM retrospective ending this Wednesday 9/8), is a thoroughly likable cad who proves surprisingly adept at physical comedy. Not just a striking beauty, Vanessa Paradis (the French recording artist and Johnny Depp’s significant other), is indeed charismatic in a realistically mature and sophisticated way as Lippi’s betrothed target. They look good and even dance well together, as when they recreate the climatic Dirty Dancing number during one of Lippi’s more ambitious seduction attempts. Chaumeil cut his teeth with AD and unit work on Luc Besson productions like The Fifth Element and The Professional. Despite radical differences in genre and subject matter, he seems to have picked up a good sense of pacing through those gigs, because Heartbreaker never loses momentum. Its light and frothy atmosphere is further heightened by the beautiful Monte Carlo settings, which glisten through the lens of cine matographer Thierry Arbogast. Indeed, the film makes the most of its exclusive locale, even throwing in a cameo by model Victoria Silvstedt for added glamour. 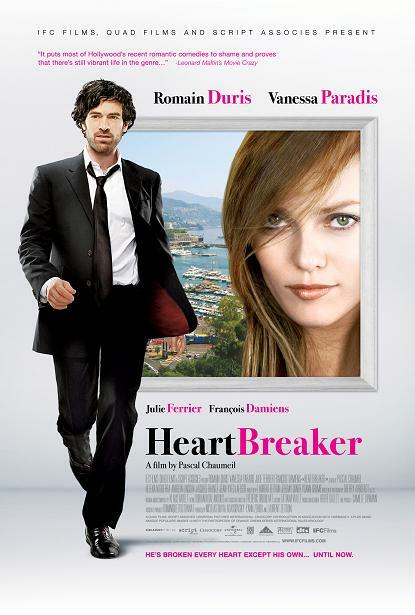 Heartbreaker is like a French film trying to be a Hollywood movie, but doing a better job of it. It has an engaging charm that might not offer many surprises, but delivers plenty of satisfaction. A pleasing little film to spend time with, Heartbreaker opens this Friday (9/10) at the IFC Center.